Easy Fogo De Chao Brazilian Cheese Bread Copycat Recipe – get the deliciously light and cheesy crazy addictive cheese bread rolls form Fogo de Chao at home in no time! These fluffy, puffy Brazilian cheese bread rolls are a family favorite – small and perfect alongside any dinner! 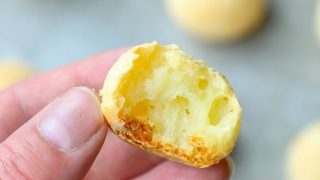 If you’ve ever been to Fogo de Chao, Rodizio Grill, or another Brazilian style steakhouse, you’re probably very accustomed to the tiny, addictive Brazilian cheese bread rolls (Pão de Queijo) that are diabolically tempting. 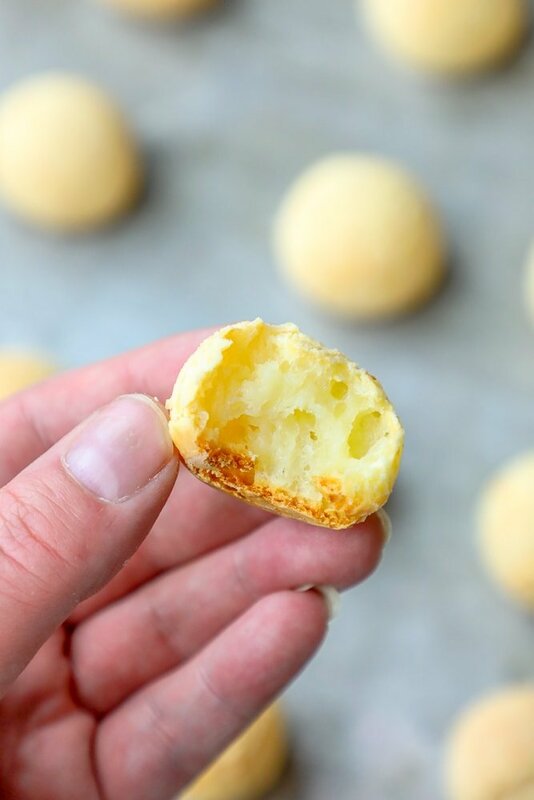 Brazilian Cheese Bread Rolls are light, springy, and full of cheesy flavor – it is easy to eat hand fulls of Brazilian Cheese Bread Rolls and still want more! This super easy cheese bread recipe doesn’t take any special equipment (I’m even going to tell you how to get perfect circles without a cake pop or other mini round pan). The dough can easily be frozen for an easy appetizer you can pull out and pop into the oven anytime! This Brazilian Cheese Bread Roll recipe is naturally gluten free and works on many low carb diets since we’re using tapioca flour. Consult with a dietician if you’re following a strict low carb diet – but these cheese rolls will very likely fit into your clean eating plan! JUST TAKE ME TO THE EASY FOGO DE CHAO BRAZILIAN CHEESE BREAD ROLLS RECIPE ALREADY! If you’d rather skip my (very helpful, i think) tips and tricks, essential cooking info, and similar recipe ideas – and get straight to this deliciously easy Brazilian Cheese Bread Rolls Recipe – simply scroll to the bottom of the page where you can find the printable recipe card. 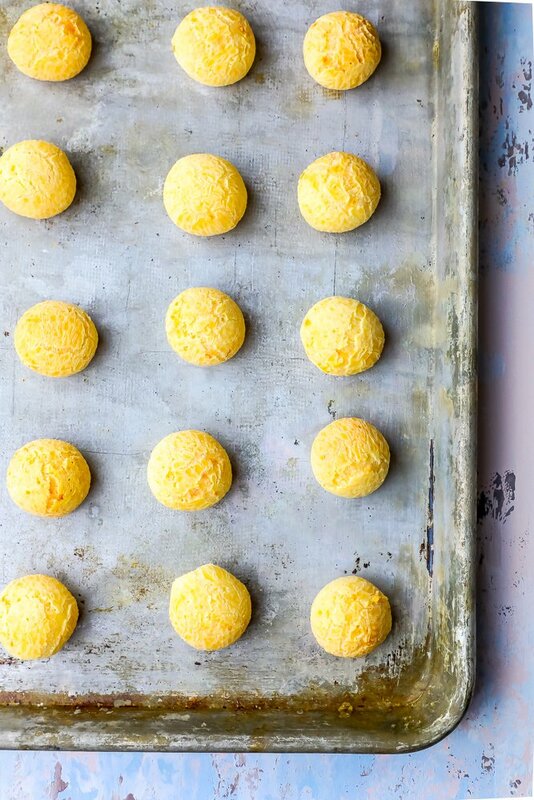 These Brazilian cheese balls are SUPER easy – but there are a few tips and tricks to make these perfect, every single time. I am including tips on making these delicious cheese rolls – but also some tips on how to shape them, as well as make the dough ahead of time, then frozen, for an easy to cook appetizer that is great anytime you want it! The absolute easiest way to make these Brazilian cheese rolls is to divide the dough into a muffin pan or cake pop pan – no special scooping and spacing required as in the recipe below. To use this method, grease a muffin tin or cake pop pan well and prepare Brazilian cheese rolls as noted below. Instead of scooping dough with an ice cream scoop, use a spoon to divide dough into small scoops and place in tin or pan. 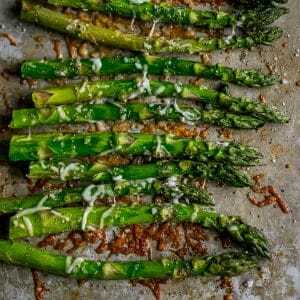 Place in preheated oven and bake as listed in recipe. 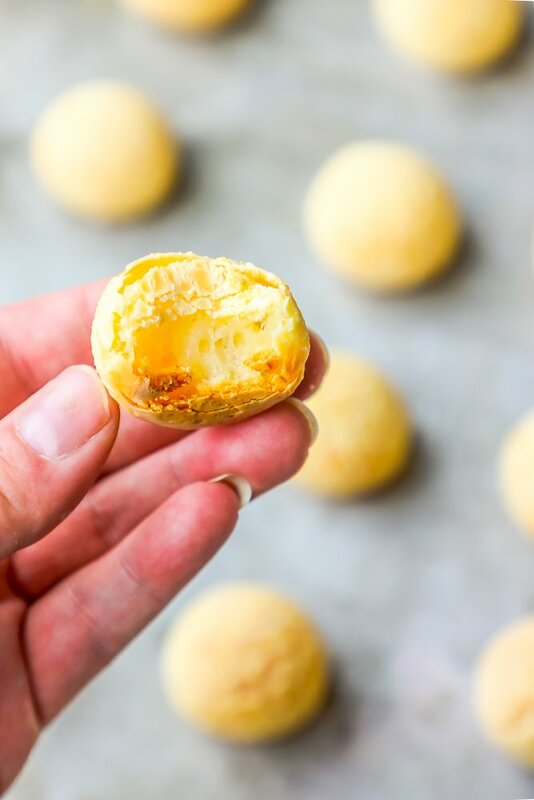 These Brazilian Cheese Rolls are one of my favorite appetizers to make because you can whip up a huge batch, roll them into balls, and freeze. Now you have delicious, cheesy bread roll you can simply pull out of the freezer and plop into the oven anytime you want one! To freeze these rolls and be able to pop them into the oven anytime you are looking for a delicious easy appetizer, prepare as listed in the recipe below and place onto baking sheet lined with parchment paper or a silicone mat. 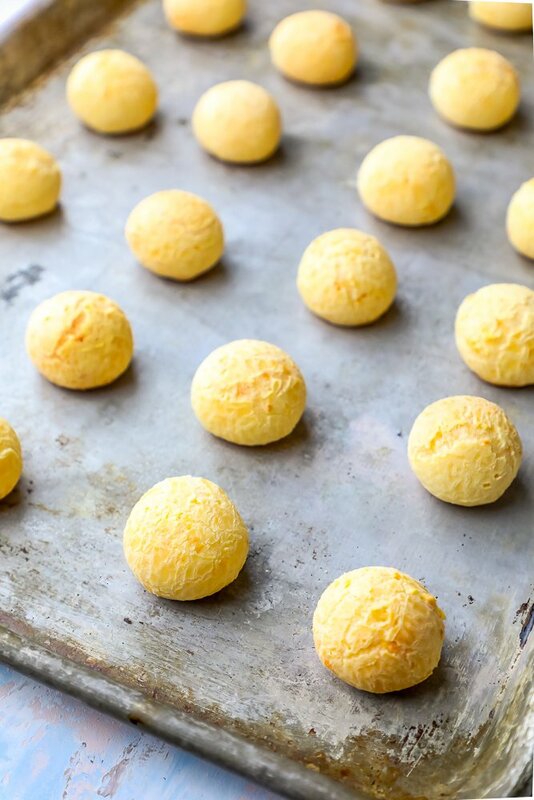 Instead of baking, pop the Brazilian Cheese Balls into the freezer. Freeze 2-5 hours, until firm, and then remove from baking sheet and place into plastic ziploc bags, removing any excess air from bags. Freeze up to one month. 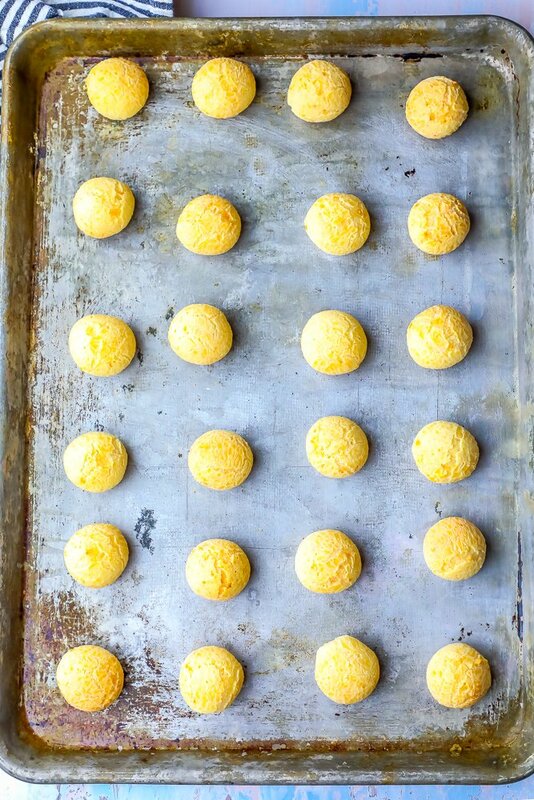 To bake Brazilian cheese rolls that you’ve frozen, simply remove from freezer, DO NOT DEFROST, and bake at 350 on baking sheet for 15 minutes until piping hot, soft, and the outside crust is crunchy. Lining your baking sheet with silicone or parchment paper isn’t necessary if baking from frozen – but is still a good idea for absolutely easy cleanup. While the exact tools you need will vary a bit based on what method you use (if you pre-freeze the rolls, they will hold their round shape and you don’t need to use any kind of muffin tin or round pan like a cake pop pan) – you can also just cook them in those to make them in no time! 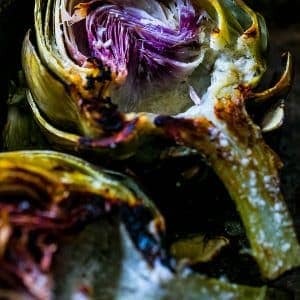 This recipe is super adaptable to what you have on hand – so go ahead and make do with what you have! If you love these deliciously easy Brazilian Steakhouse Style Cheese Rolls, you’ll love these other delicious dishes that pair fabulously with steaks, fish, chicken, pork, and more! If you love this Easy Fogo De Chao Brazilian Cheese Bread Copycat Recipe as much as I do, please write a five star review, and be sure to help me share on facebook and pinterest! Easy Fogo De Chao Brazilian Cheese Bread Copycat Recipe - get the deliciously light and cheesy crazy addictive cheese bread rolls form Fogo de Chao at home in no time! These fluffy, puffy Brazilian cheese bread rolls are a family favorite - small and perfect alongside any dinner! Preheat the oven: Arrange 2 racks to divide the oven into thirds and heat to 450°F. Line two baking sheets with parchment paper, foil, or a silicone baking mat. 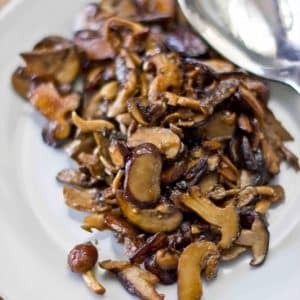 In a medium saucepan over medium high heat, place the milk, oil, and salt in and bring to a gentle boil over medium heat. Stir occasionally to prevent burning. When you see big bubbles forming, remove from heat. Add tapioca flour and stir in until completely mixed. Dough will be very heavy and sticky at this point. Transfer dough to a stand mixer fitted with the paddle attachment. Beat dough for a few minutes until it is slick and cool to touch. When dough is cool enough to hold your hand to for a few seconds, beat eggs in one at a time - let the mixer incorporate the eggs completely before adding in the next. Scrape down sides of bowl if needed. Beat in the cheese until fully mixed through. 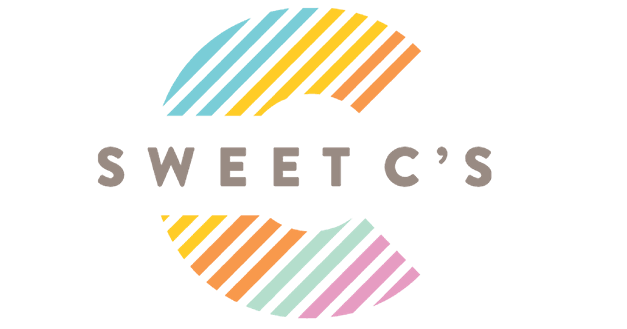 Dough will be soft, lumpy, sticky, and a consistency between cake and cookie dough. Using a small ice cream scoop (keep a bowl of hot water nearby to clean and heat the ice cream scoop for easy cleaning and scoping), scoop out small balls and place them on lined baking sheet. OR, add dough to greased muffin tin or cake pop pan. 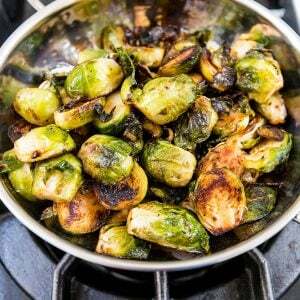 Place the baking sheets in the oven and immediately reduce the heat to 350°F. Bake for 15 minutes. 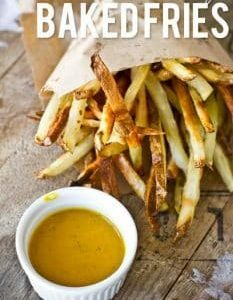 Bake until the puffs have puffed, the outsides are dry, and they are just starting to turn golden-brown on the bottoms, 10 to 15 minutes more. (The tops will not brown much.) Cool for a few minutes and eat warm. 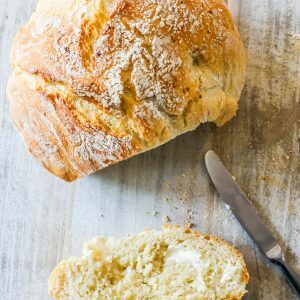 love this easy fogo de chao brazilian cheese bread copycat recipe, will surely give it a try and see how it turns out!